The New CAPTUR has evolved by taking a step closer in style to its bigger sibling, the Kadjar. The radiator grille has been modified to bring it more into line with Renault’s crossover family, with the notable addition of a chrome strip. At both the front and rear, the bumper incorporates new skid plates in evidence of the CAPTUR’s adventurer credentials. The C-shaped LED Daytime Running Lights, recognised as the brand’s lighting signature, are incorporated into the bumper. The rear lights similarly include this hallmark, visible both night and day. Full-LED ‘Pure Vision’ front lights (depending on version) enhance both the vehicle’s look and safety, while reducing glare. The New CAPTUR builds on the model’s original success, including its striking two-tone colour scheme, with three new body colours: Desert Orange, Ocean Blue and Amethyst as well as a new Mercury Silver option for the roof. There will be 36 potential combinations enabling customers to tailor the appearance of their New Captur to match their personal taste. Three types of wheel are available across the range: one 16-inch (Adventure) and two different 17-inch wheels (Emotion and Explore). Seven different interior touch packs are available in Ivory, Blue, Caramel, Red, Bronze-tinted Chrome, Satin Chrome and Smoked Chrome. These are complemented by exterior customisation packs in a choice of six colours: Ivory, Blue, Cappuccino, Red, Satin Chrome and Orange. The cabin is more refined, benefitting from higher grade plastics, sleek chrome and elegantly subdued colours. The steering wheel also benefits from higher grade materials. The gear lever boasts a more modern appearance, while the door panels have been revised to seamlessly incorporate buttons and controls. The new seat design is more cosseting, offering additional lateral support and greater comfort. At the same time, New CAPTUR retains its most practical features, including its zip removable and washable upholstery. Some new fixed upholstery designs are also offered, including two new part-leather upholsteries. Each version provides a comprehensive standard specification, rising to the truly luxurious toward the top of the range. The CAPTUR has Euro NCAP’s maximum five-star safety rating. All New CAPTUR models have a reinforced structure, high-efficiency front airbags, head/chest side airbags, seat belts with pre-tensioners and force limiters (front seats), anti-whiplash headrests, force limiter function (rear side seats), anti-submarining front seats (Fix4sure). For child safety there are three-point ISOFIX child seat anchor points on the front passenger and outer rear seats. All versions of New CAPTUR are equipped with ABS with Emergency Brake Assist, Electronic Stability Control, Electronic Traction Control, cruise control, speed limiter and Hill Start Assist, providing a comprehensive array of systems to support safe handling and prompt, reassuring braking performance. It also benefits from a Roll Movement Intervention system, which helps restore stability in extreme situations where an excessive angle of body roll is detected. For the first time, the New CAPTUR incorporates Blind Spot Warning, which is available from Dynamique S Nav. Four sensors work together to detect the presence of moving vehicles in the door mirror blind spots, including motorbikes and bicycles. When a vehicle is detected in the driver’s blind spot for longer than a second, a warning indicator immediately lights up in the door mirror. Active at speeds between 19mph and 87mph, this technology makes motoring safer for everybody. In addition to its rear parking sensors, and depending on version, the New CAPTUR is also available with front parking sensors and a reverse parking camera to simplify manoeuvring and help to avoid the bumps and scrapes that are an everyday risk in built-up areas. Three multimedia systems are fitted according to equipment level: R&GO®, Media Nav and R-LINK. R&GO® is Renault’s smart, simple system that transforms the user’s smartphone into a connected tablet installed in a universal cradle. This practical system enables the user to intuitively access the car’s most useful functions, including navigation (through an in-app purchase), telephone, multimedia and vehicle data. Renault R-LINK provides the New CAPTUR with an advanced multimedia system. More customisable than ever, it comes with a 7-inch screen. It incorporates navigation with real-time traffic updates, 3G connectivity, Bluetooth, media playback (photos, videos) and a wide variety of applications via Renault’s R-LINK Store, as well as management of the vehicle’s driving aids (depending on version). For the first time R-LINK is compatible with Android Auto™ granting users easy and direct access – via the 7-inch R-LINK display – to smartphone applications: telephone functions, navigation, music and messages. 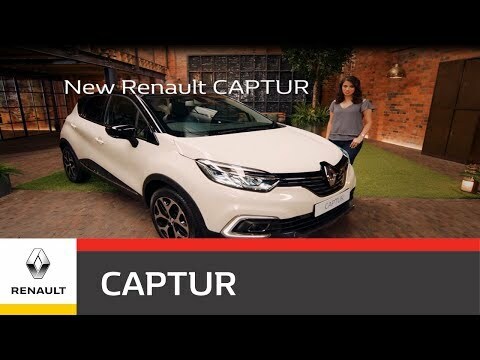 The New CAPTUR is the first A- or B-segment Renault to offer this advanced technology.